Josie Gallagher has been living with a secret for the past six years. Imagine her surprise when she meets Jacob Weatherly, the man who works for the company that bought out her restaurant property and with him, Addie, the sweetest little girl she has ever seen. In fact, the same little girl that just so happens to be the daughter she gave up for adoption all those years ago. Time and circumstances have brought them together and Josie is going to do everything within her to right the situation. First, there are questions that need to be answered. What happened to the couple that Josie signed away her rights to? How did Addie end up with Jacob, a single father trying to raise Addie on his own? Finally, just how does Jacob propose that Josie can save her restaurant and not give up her dream of a lifetime? 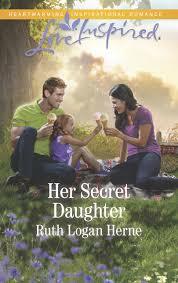 Author Ruth Logan Herne has written a beautifully scripted story that will pull at the heartstrings of many readers. In today’s world, almost every single person has been touched by adoption and should find this novel relatable. A strong story line with well-developed characters are the beginning to any great piece. Background information from previous books in the series is not a necessity, Her Secret Daughter is skillfully written and Herne has succeeded in creating a book that could stand-alone on its own. Void of profanity and any questionable material, this Love Inspired book will quickly draw the reader in and engulf them with a warm and fuzzy feeling by the end of the book. Readers looking for a happy ending will not be disappointed!